Harness Pros And Cons For An Indoor Kitten? Discussion in 'Grooming & General Cat Care' started by marblesmom, May 20, 2017. Hi all! I don't remember if I introduced myself on this forum already before Marbles is a 7-month old girl who came to us from foster care; she has always lived inside. She looooooves to look outside through our big windows though and chirp at the wildlife. I have been thinking about harness-training her. I always had indoor-outdoor cats growing up, but I do feel it's safest for her to not roam free in our neighborhood; there are lots of dogs, and I had so many cats lost or killed outside when I was a kid. But I feel badly for her being inside. She is a single cat, and I don't know if I can ever convince my husband to let her have a playmate. I feel like walking her outside would open up the world a little more for her and give her more interesting things to do. 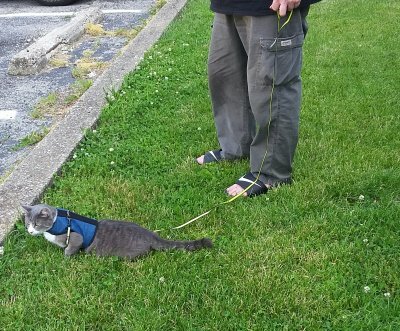 What are the pros and cons of harness-walking cats? I have read it can make them more dissatisfied with being inside, or make them into door-darters. Is this often the case? She doesn't try to get out so far. Being that she has never experienced outside, I don't really want to make her dissatisfied with her life. If you walk your cat, do they love it? Is it worth it? Also, is it hard to teach them at this age? I didn't really consider doing it til recently, and now wish I had started younger. dustydiamond1 and ignited-red purraised this. Hi there! It was a generous for you to open your home for kitty, Marble must be very happy to have a new home and families! I used to harness walk my cat outdoor, so when I go for a walk, I took my cat also but seems that my male cat did not like being outdoors at all. When I tried to put harness on him, he struggles the way he can, then when the harness are on, he suddenly stop walking and rolling outside with his harness. He did that every time. From that on, I never harness my cat again, if I want to take a walk, I just carry him around my shoulder hahahaha. You might be want to try to put harness on Marble and see what's her reaction, if she didn't like it, you might want to stop to prevent her from stressing. But I think it is best for cats to be harness when you do walk outside to prevent unwanted things happen like they might be running off from you and be missing, or hit by vehicle, bitten or chased by dog. I know that cat likes nature, but if street are too dangerous for them to roaming around, you can consider by building little garden in your backyard surrounding with fences. That way, your cat can enjoy nature and sun without you worrying her running to the streets. Our guys out out at least 5 times per week for minimum an hour each time, wearing harnesses. I would take them out more but we are working alot. I connect the harnesses to 40 foot leads and sit out with the cats. The cats love it and it improves their lives. They are door darters....but if they run out side, they dont venture more than 20 feet from the door and can be easily picked up and brought back. However the problem I have is I feel guilty if I dont take them outside and it takes up huge amount of my time......often a couple of hours a day. I don't have the time to spare and it means I cant get other things done that need to be looked after. ...but the boys love it and it gives them exercise....so I continue to do it. Im thinking of building a very large outdoor enclosure for them. Hi marblesmom, she sure is a cutie. Our 2yr old (vet guess) ex-stray Gypsy has been a full time house cat since she came home limping in Feb 2017. She really wanted to go out when the weather got nice so I picked up a nice 'H' nylon harness from Petco. We had no idea if she had ever been on a leash before. She did really well in it but twice she was able to get her back paws under the waist strap and flip it off. We may not have cinched it tight enough but since the neck strap was still in place she was still secured while we picked her up. After considerable research I decided on the Kitty Holster Cat Harness. It fastens with Velcro at the neck and the waist and we feel very safe with her in it. Although we are a single cat household she seems quite happy inside, doesn't stand forlornly by the door anymore . She has lots of window perches to watch the squirrels and birds from. It has been such a hot, humid miserable summer that we haven't been able to get outside with her as much as we would like but she is content inside. There are more photos of our outdoor adventures in my albums. 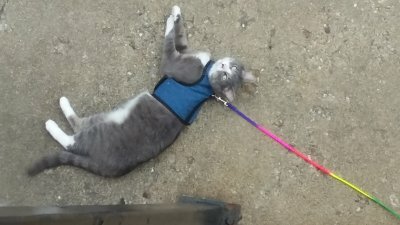 What are the pros and cons of harness-walking cats? Greg and Arnold both are harnessed and let outside on long leads with constant supervision. We have been doing this for at least a year. But there are cons: Both cats have on occasion escaped from their harnesses. It has lead to some tense moments and once arnold came home frightened and with a scratched nose. The cats must be constantly watched, if they start to struggle out of their harness, they must be attended to immediately. Greg did attack a neighbour's peaceful friendly, although very large dog, and Arnold will also do so if given the chance. (Only an hour ago a neighbour stopped to chat with me, he had 2 dogs and Arnold was approaching them menacingly.......I know his look. If left alone there would have possibly been injuries). Arnold and greg both like to hunt and they have caught chipmuks, birds, a baby rabbit, recently a mouse and countless moths and insects. I always intervene ASAP, but there have been casualites, I do not want wildlife injured or killed. Greg had to be taken to the vet when a chipmunk bit his face. (the chimpmunk did not fare as well). Infections are a possibility. Another issue is time. Once the boys got used to going out, I dont have the heart to not let them out daily. As they must be supervised, great chunks of my time are committed to this task.........min an hour a day. In fact we just spent at least 2 hours outside this morning. (But this "con" is also a "pro" because it forces me to stop, relax and de-stress). The cats have become door darters, but are excellent in that even if they get by the door, they never run more than 10 or 20 feet from the door and then let me pick them up and bring them back in. They are also very good as they dont cry and whine endlessly if they cant go out. Hope some of my experiences help you decide. For us the pros out weigh the cons. But everyones situation is different. However the problem I have is I feel guilty if I dont take them outside and it takes up huge amount of my time......often a couple of hours a day. I don't have the time to spare and it means I cant get other things done that need to be looked after. View attachment 181299 ...but the boys love it and it gives them exercise....so I continue to do it. Im thinking of building a very large outdoor enclosure for them. What a fantastically beautiful yard and fur babys you have!! Love your gargoyle too! Thank you, kind of you to say so. Greg and arnold love the hostas. That pic was from last year; the hostas have grown more, giving the boys many places to hide under and watch the world go by. I should add that one of the pros of taking your cat outside on a harness is increased exercise. Greg and Arnold have each lost a pound or two over their winter weight and I think that is because of their outdoor activities. My cat are lash and harness trained and go outside for an hour a day on leads. Typically it's just in the backyard as they are not interested in going further since we moved to an urban environment. I like using the leash even if I'm not holding it all the time (we will play with an interactive toy while in the backyard). I can grab them if they go for the trees (both my guys are tree climbers). They definitely get a lot of exercise outside which helps the settle for the night. They also look forward to their time outside. However, my male cat has gotten out of his lead twice. I ended up buying a new one just because the older one was starting to get snug around his middle. That is why he was able to get free, by forcing his tummy out. When he got out he went for the trees and explored the neighbours yards for a few hours. It was very terrifying. However, since they had been indoor/outdoor before (we used to live very rural with few threats as long as they were only allowed out during the middle of the day) he was comfortable finding his way home. A cat that has been indoor only may not be as territorially saavy. One of our cats also got up a tree and got her leash stuck (my son wasn't paying attention and she pulled free), but we were able to detangle her. I kept my cats inside for a week after each of these incidences. When we trained them we tried a few different harnesses. They abhored every one but the large velcro enclosure style. Anything with snaps they would just roll over and stare at me. So it is important to try a few styles if they reject the first. I walk my single cat every day for at least 30 minutes. To counter one of the cons both of the people above mentioned, Elfie has never broke out of her harness and she has not become a door dasher. She's a rather docile cat, which is why I wanted to train her to go out. I found that, at 1 years old, she was less confident than I wanted her to be. Not scared of people at all, but any new/loud sounds scared her off and she waited for me to give her attention instead of come to me and ask for it. It did pay off exactly the way I wanted. She's more confident, and I can trust her to come to me to ask for what she needs instead of suffer in silence when I forget treat time. It took a long time because she was a scaredy cat and didn't like the outside, but she's a different, more demanding/confident cat now and I'm extremely happy I took the time to start doing this for her. She has a richer life now. Once she started enjoying going outside she wanted out all day. She'd meow at the door the entire day. But she doesn't do this anymore! Personally I just had to be very consistent. Walks had to be at the same time every day for her to understand that she had to wait. Now she meows at 7pm every day, when she sees me in the kitchen washing my dishes lol. It's actually really funny now. It was stressful in the beginning and made me feel like I was depriving her of a full life. Which is bull! It was just very new and exciting. It takes up a chunk of time. Like people who have dogs say: not every walk is fun. Usually I just watch some YouTube or listen to a podcast when I'm out with her, but when I have a project in mind it's annoying. It can really clear my mind for a bit though, just really depends on the day. You will feel bad if you can't do it for a day. It's become such a routine for her that, sometimes if I want to go out for dinner with friends I'll get an image of her meowing at the door at 7pm lol! I'll decide either to go home before the dinner, take her out and go enjoy myself - or come home earlier afterwards, around 8-9pm, so I can take her out a bit later. You feel like you have a dog. I love cats. I got a cat with the thought that they're independent. And while she certainly is less needy than a dog, fitting walking your cat into your day makes you feel like you got a dog. But honestly, dogs have to go out 2-3 times a day, so I have it good. Makes you feel guilty for doing the right thing and keeping them inside. Cats enjoy the outdoors, and it makes you wish you could give them that whenever they wanted. In a perfect world I would, but this is a good compromise. Planning to stay away is harder I guess? You'll have to find a sitter that is willing to learn how to walk her and someone that you trust can take care of that. Or you decide to not have her walked, which is a disruption of her routine and that can be stressful for cats. However, if you do find someone who can walk her daily you can leave with the peace of mind that she gets a stressrelieving expierence and some exercise every day. I do plan on making her an enclosure when I move next year, and getting a second cat. I'll probably continue to walk her - but maybe not as often. As a single cat I feel like it is a necessary part of her day. If she had the enrichment of a companion and an outside enclosure I wouldn't feel the need to do it so religiously. But as for now, with her being a single cat, I can't imagine not doing it. I hope you do start taking your kitty out, and wish more people did! Keep in mind she had a "bear cut" this summer so her coat looks dull. It's all undercoat! My cat has always been a door-darter since she was 3 months old. Taking her out on a leash hasn't made it better or worse. I think she would love to be an indoor-outdoor cat, but it's just way too dangerous where I live. She loves to go outside and cries when I make her go back in the house. She would stay out there all day. Even in the snow, she wants to go out. The bad thing I see is a always have to pay for flea prevention if shes going to be outside all the time.